Carlo Ancelotti has written another golden page in Real Madrid's history books, after beating Malaga away from home by a 1-2 scoreline and setting a new club record of 16 straight wins. Cristiano Ronaldo didn't score this time, but Benzema in the first half and then Gareth Bale in the last 10 minutes of the game, sealed tonight's victory in La Rosaleda that will allow Real Madrid to maintain their lead in La Liga. Real Madrid rattled off their record 16th straight win in a row tonight by beating Malaga by 0-1, but it wasn't easy against a plucky and tenacious home side, who pushed Los Blancos to the limit. Their custodian in goal, La Liga veteran Cameroonian Carlos Kameni, was excellent denying Madrid repeatedly from point bank range, which effectively kept Malaga in the match. The Merengues had their strongest available side ready for this match, Carlo Ancelotti likely realizing the trick prospect that is a visit to La Rosaleda. Javi Gracia's side, who have done really well in recent weeks, were very active and vibrant during many periods of the game, never giving Real Madrid an inch in the early going. It wasn't until a Cristiano Ronaldo center to in-form Karim Benzema, that Madrid would eventually take the lead. On the left wing, Ronaldo bode his time and eluded two defenders before squaring a low hard shot to the Frenchman, who did excellently to spin away from his marker Welington. It was a well-deserved goal for Real Madrid, who themselves had already come close a few times. Still, the goal did nothing to temper Malaga's spirit, as they continued to battle hard. 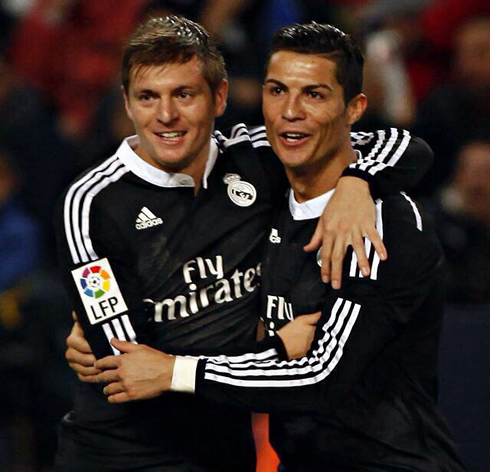 Toni Kroos, who recently complained about fatigue, was not his usual self today in the center of the park. Though there were no real mishaps, he seemed lethargic and anonymous at times. Perhaps the upcoming break that Ancelotti has promised him (Real Madrid takes on UE Cornellà next Tuesday for the Copa del Rey), will give the German a chance to reset his batteries. His partner Isco had a decent game in midfield, returning to the stadium where he made his name a few years ago. Despite a crucial miss in a 1-on-1 situation after a Cristiano Ronaldo pass, he routinely broke open a frustratingly intelligent Malaga off-side trap. In defensive midfield, he continuously chased attacking midfielders, but he was at times perhaps guilty of being over-zealous. A trait that would eventually have him sent off in the dying moments of the match, as he took the ball from Samuel Castillejo, Malaga's brilliant teenager, from behind for his second bookable offence. An already shorthanded Real Madrid will have to do without him the next time out. In the second half, it was more of the same. Real Madrid continued to dominate possession, but Malaga held firm, almost causing some havoc themselves. Roque Santa Cruz was a lot for Sergio Ramos to handle for the majority of the match. Eventually, the visitors would put the result beyond doubt in the second half as Gareth Bale used his trademark pace to great effect. Peeling away from his marker after Ronaldo flicked on a Marcelo cross field ball, Bale took the ball in full stride and finished with his weaker foot over Kameni. It was a much needed goal from the Welshman, who has struggled throughout the first half of the season thus far. The assist from Ronaldo, his second of the match, tied him with Atletico Madrid's Koke for the most assists in La Liga so far. In fact, the Portuguese international now leads La Liga in both goals and assists this season, with 20 and 8 respectively. Still, Real Madrid would have to remain alert as the clock wound down and a free kick late in the game bought the best out of San Iker, who has done his best to mimic his counterpart's excellent match. Eventually however, Santa Cruz would get his reward for all his hard work with a header in injury time, but the game would end soon after, denying Malaga a chance to make things really interesting. 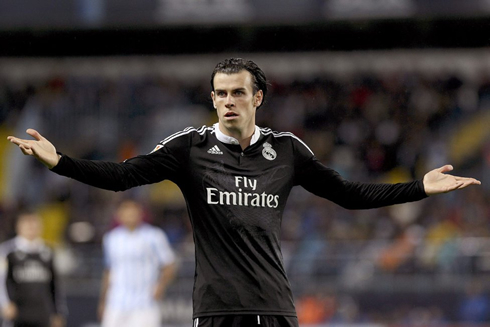 It was a professional performance from Real Madrid, who would be happy to have avoided losing points away from home. With Barcelona and Valencia slated to what will surely be a blockbuster of a tie tomorrow night at the Mestalla, it was a much needed victory to keep the La Liga's dream alive. Cristiano Ronaldo next game will be for the Copa del Rey against UE Cornellà, a match scheduled for next Tuesday, December 2. You can watch Juventus live stream, Real Madrid vs UE Cornella, Valencia vs Barcelona, Southampton vs Manchester City, Tottenham vs Everton, and Eintracht Frankfurt vs Borussia Dortmund, all matches provided from our soccer live streaming game pages.